Thursday, June 7, 1888 Bessie has returned from school. Still cool, & cloudy with few sprinkles A.M. certain. Much as usual with our folks, & guess spending day about same, Charlotte not out farther than to her Fathers think. Know Katie Pratt drove out to Rosa-'s Niece's with her & Boys this P.M. After another good nights rest, as well self, & occupied much same aside from searching for knitting patterns, learning was M.S. supper prevented my getting out in eve. Friday 8 Very warm, & pleasant except for strong breeze. 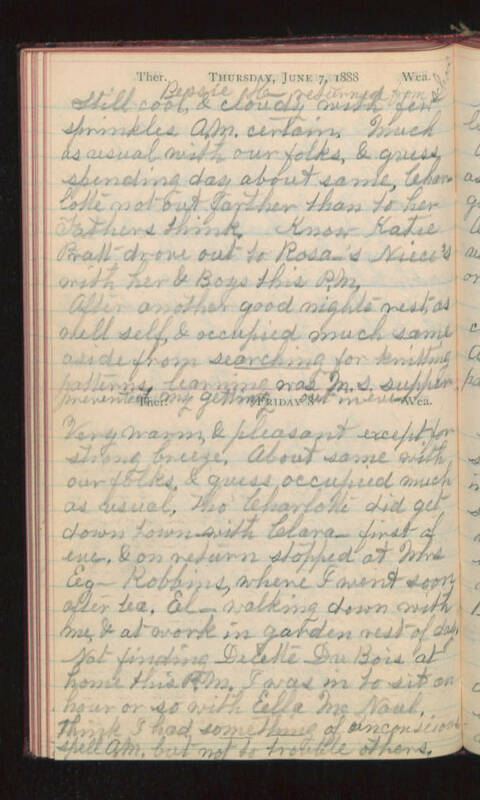 About same with our folks, & guess occupied much as usual, tho Charlotte did get down town with Clara - first of eve, & on return stopped at Mrs Eg- Robbins, where I went soon after tea. El- walking down with me, & at work in garden rest of day. Not finding DeEtte Du Bois at home this P.M. I was in to sit an hour or so with Ella McNaul, think I had something of unconscious spell A.M., but not to trouble others.